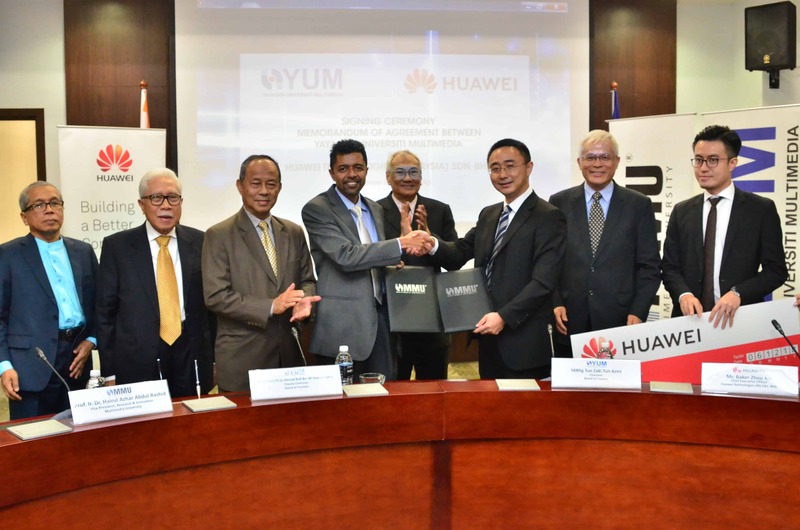 Yayasan University Multimedia (YUM), a non-profit organisation under Multimedia University (MMU) inked a Memorandum of Agreement (MoA) with Huawei Technologies (Malaysia) Sdn. Bhd. on a sponsorship agreement for MMU students. With the agreement, Huawei will offer a five-year scholarship worth RM420,000 to eligible students from Engineering, Information Technology (IT) and Business & Accounting programmes. The MoA was signed by Prof. Datuk Ts. Dr. Ahmad Rafi Mohamed Eshaq, the President of MMU and the Deputy Chairman of YUM, and Mr. Zac Chow Chii En, the Vice President of Huawei Technologies (Malaysia) Sdn. Bhd., together with Prof. Ir. Dr Hairul Azhar Abdul Rashid, the MMU Vice President of Research and Innovation. 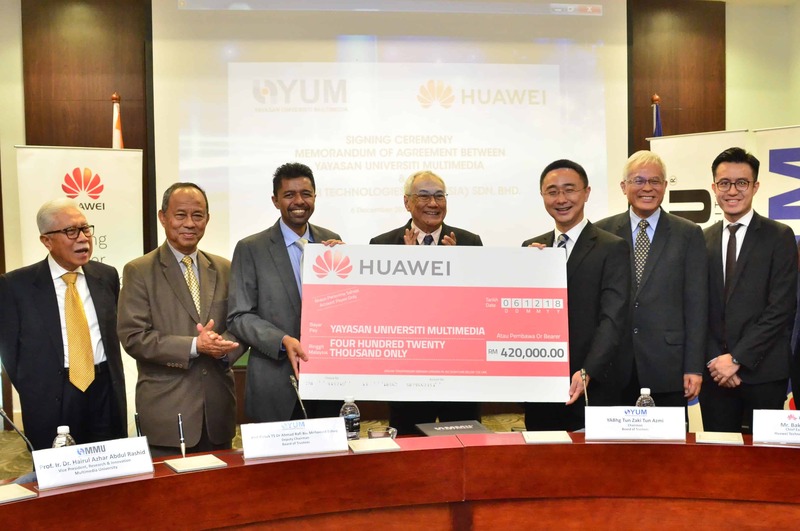 The ceremony was witnessed by Tun Dato Seri Zaki Tun Azmi, the Chairman of YUM; Mr. Baker Zhou Xin, CEO of Huawei and the members of YUM’s Board of Trustees, Tan Sri Dr. Sulaiman Mahbob, Dato’ Wong Siew Hai, Dato’ Zainal Abidin Putih and Dato’ Ismail Osman. MMU’s prowess is reflected when the university is ranked at 175th in Quacquarelli Symonds (QS) Asia University Rankings 2019. In addition, according to MDEC’s Malaysian Digital Talent Study 2017, MMU’s IT graduates are the most preferred by Malaysian Firm. Mr. Baker Zhou Xin, Huawei regarded MMU as a well-known university that produced a quality graduates and talents for the ICT industry. “We found this fact is very true, when about 213 of Huawei’s staff and experts who working around the world are actually MMU’s graduates,” he added. With the agreement, the students will have the opportunity to attend the Huawei Technical Training Programme as well as a place for an internship programme and job opportunity that bonded with Huawei after graduation. 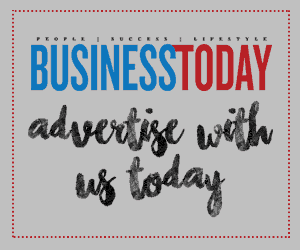 Other scholarships available in MMU are the President Scholarship, Merit Scholarship, and Sports Excellence Scholarship for April and June 2019 intakes. Also present, Chief Procurement Officer of Telekom Malaysia (TM), Mr. Mohamad Mohamad Zain, Director of YUM, Datin Noorlindah Hassan and HR Director of Huawei for Southern Pacific Region, Mr. Zhu Rui.